The annual Cultural Heritage and Tourism Alliance Summit wants to showcase local talent and artwork at the Signature Grand Conference Center on May 9-11, 2019. Ten (10) local artists will be accepted to participate in the Artists’ Village and will receive a complimentary full Summit registration. 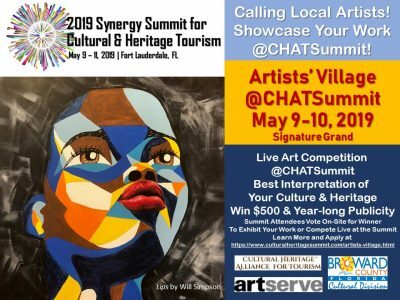 Additionally, the CHAT Summit is looking for 2-3 local artists to showcase their skills during a Live Artist Competition during the Summit on Thursday, May 9, 2019. The selected artists will render a work of art that expresses the theme “My Culture. My Heritage.” The winner will be awarded $500 plus one (1) year of publicity via CHAT’s website and social media. The winning artwork will also be used on various mediums as a representation of the Cultural Heritage Alliance for Tourism, Inc. To be considered as a participant for the Live Artist Competition, please send a 8×11 mock-up or sketch of the artwork (in a jpg or pdf format) that will be produced during the live competition to alex@culturalheritagesummit.com no later than April 15, 2019.